I bought them on sale at Joann online, but they have them at many other scrapbooking sites. I chose these albums because they all have the matching black binders, but I can decorate each album cover according to what’s inside. Details: First, I custom mixed paint to match. Then I painted the front and back cover solid green (after I finished my design I realized I could have painted just the edges… maybe next time). 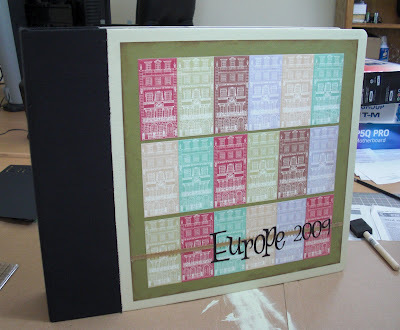 I attached the papers from the base up using mod podge matte finish. This was to avoid getting an bubbles between the layers of paper. I just used my Xyron sticker maker to attach the letters. Then I mod podged over the entire album to create a protective coat.